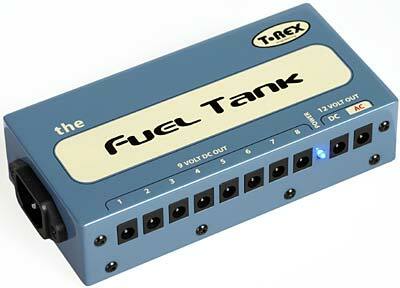 T-Rex Fuel Tank Classic, multi-output power supply for effect pedals, 1.500 mA through 10 DC plugs, 3 output sections: 8x 9V DC sharing the same ground total of 500 mA, 1x 12V DC with isolated output 500 mA, 1x isolated 12V AC output 500 mA, Voltage selector 115/230 volts, blue LED when unit is on, size (W x H x D) 160x38x78 mm, weight excl. packaging 0,800 kg. Included: 1 x 100cm mains power cable, 1 x Red 50cm DC cable with 2,1mm - 2,5mm connectors for use on the 12V AC outlet port, 1 x Blue 50cm AC cable with 2,5mm - 2,5mm connectors for use on the 12V AC outlet port, 1 x Black link cable with five 2,1mm - 2,1mm connectors, 1 x Black 50cm DC cable with 2,1mmDC - 3,5mm mini-jack connectors, 4 x 50cm DC cables with 2,1mm -2,1mm connectors, 4 x 20cm DC cables with 2,1mm -2,1mm connectors.